Since it is pomegranate season (September -January) and since I bought some beautiful ones last week for just $.49 each, let’s talk pomegranate power. Each 4″ fruit provides an impressive 11 grams of fiber and 5 grams of protein. And … contains a compound called punicalagin, which has known heart and blood vessel benefits. Studies have shown it decreases cholesterol levels and blood pressure and even helps heart blockages dissolve. When heart patients were given just 1 oz of ponegranate juice daily for a year, their blood pressure decreased by 12% and they had 30% less plaque in their arteries. The control group who didn’t get the juice had 9% more plaque at the end of the year. And… has been shown to inhibit breast cancer, prostate cancer, colon cancer, and leukemia. And … is snackingly delicious! 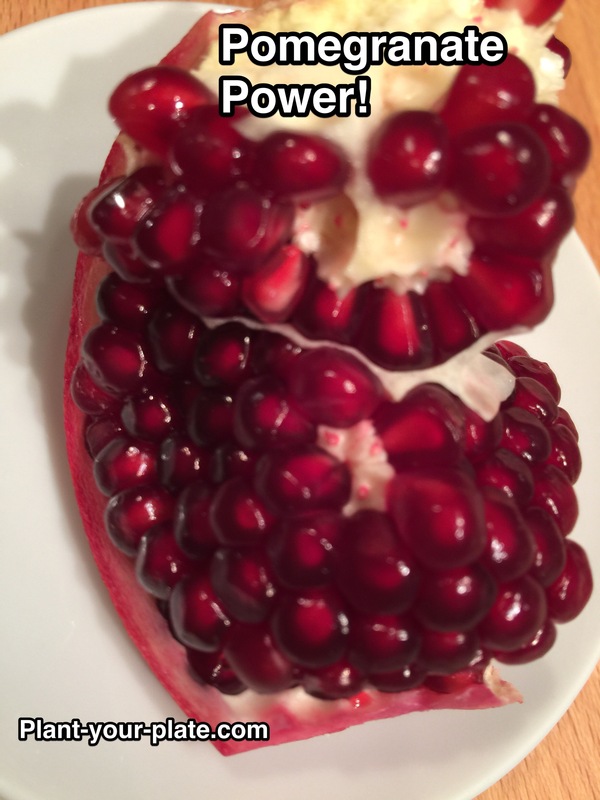 So buy a few pomegranates this season and ENJOY! Cut around the crown (the blossom end that sticks out). Just cut around in a circle about 1/2-1″ from the blossom. Then carefully remove this patch of pomegranate skin by using your thumb much like you would peel an orange. Lightly score down the ribs that extend from the crown area to the other end of your pomegranate. There should be 4-5 of these barely noticeable ribs. Now use your thumb to pull each section apart. You should be able to do so with minimal mess since the ribs are the natural dividing points. I said minimal mess not no mess; wouldn’t wear white clothes or do this over your new carpet.